Over on YouTube Leif SM5BSZ has uploaded two new videos. 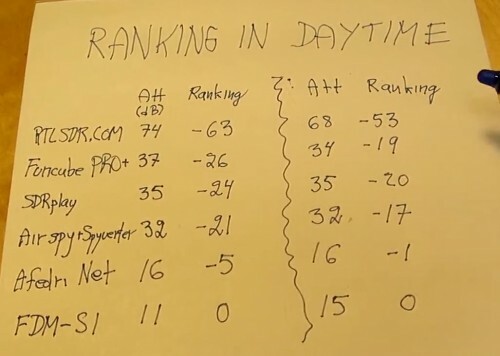 The first video shows a set up that compares the Airspy and the SDRplay RSP on several lab tests that test for dynamic range performance at various frequency offsets. The Airspy definitely shows better results, but Leif notes that the differences are fairly small. The Airspy and SDRplay are two SDRs that compete in the mid range SDR price bracket. As lab tests can only approximate real world performance, in the next video Leif does a HF reception comparison on a real world antenna. In this video he compares our RTL-SDR.com V3 in the special direct sampling HF mode, a Funcube Pro+, SDRplay RSP, Airspy+Sypverter, Afedri Net, and an FDM-S1. The test injects an artificial signal and combines signals from a real antenna via an adjustable attenuator. Leif adjusts the attenuator to increase the antenna signals until the test signal strength is degraded by 3dB from reciprocal mixing/overload. That attenuation setting is then recorded. 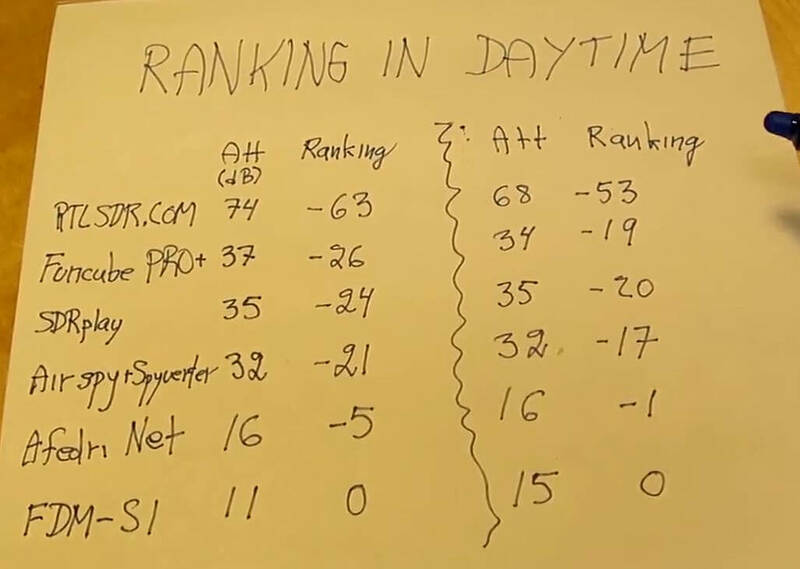 The results for the daytime and nighttime results results rank the SDR’s in order from best to worst: FSM-S1 ($400 + shipping), Afedri ($259 + shipping), Airspy+Spyverter ($218 + shipping/$149 + shipping (mini)), SDRplay ($129 + shipping), Funcube Pro+ ($155 + shipping), RTL-SDR.com V3 direct sampling ($20 incl shipping). Interestingly the performance seems to correlate nicely with the unit cost. Of course the V3 in direct sampling mode can be significantly improved by using filtering on the front end, or just by using an upconverter and quadrature mode instead. 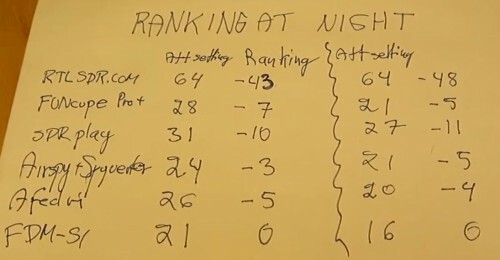 At the end of the video Leif also shows a final ranking of the HF performance of all radios tested in his previous videos. LINRAD is working very good…on one USB 2.0 Port with a HUB,I am using RTL Dongle,External Monitor,Mouse and Keyboard…no problems !!! Looks like AIRPlay is very good value for a price!!! I’m guessing the difference in dynamic range between Airspy and SDRPlay is due front end filtering as well as sensitivity, they both use a 12bit chip as dac so should have very similar dynamic ranges. The more sensitive a rx is, the less dynamic range it may have, all else being equal, so being “deaf” can be an asset more or less if one is looking at increasing dynamic range. They have been set for the same N.F. hence the same sensitivity. Some radios are better some not, regarding the BDR. Beside the A/D they are using different front ends (different tuners). Now when we have all the figures it is easy to decide what to buy depending on what you want to do with the receiver and where it is going to be used. So you are saying that the tests, by who I would consider an expert, are wrong ? My English is so bad or what? I was typing my reply, without having seen yours. Look at the times, they are within a few minutes of each other.